Help! I've just strted my first herbs and plants from seedlings, and they were doing great! I have some basil, roma tomatoes, big boy tomatoes, and some pepper all in one of those burpee eco-friendly seed starting kits...and then this morning i noticed some mold on the sides of the peat and along the rims of the containers...What do i do and what did i do wrong? They are sprouting, but am not sure that they are doing very well. The plants look very leggy and light deprived. If they are growing under artificial light, then the light should be within a few inches of the plants. If getting light from a window, then that light should be augmented with florescent light 12-14 hours per day. Also plants like a little bit of air movement. I think that your problem could be a combination of high humidity and too little air flow. 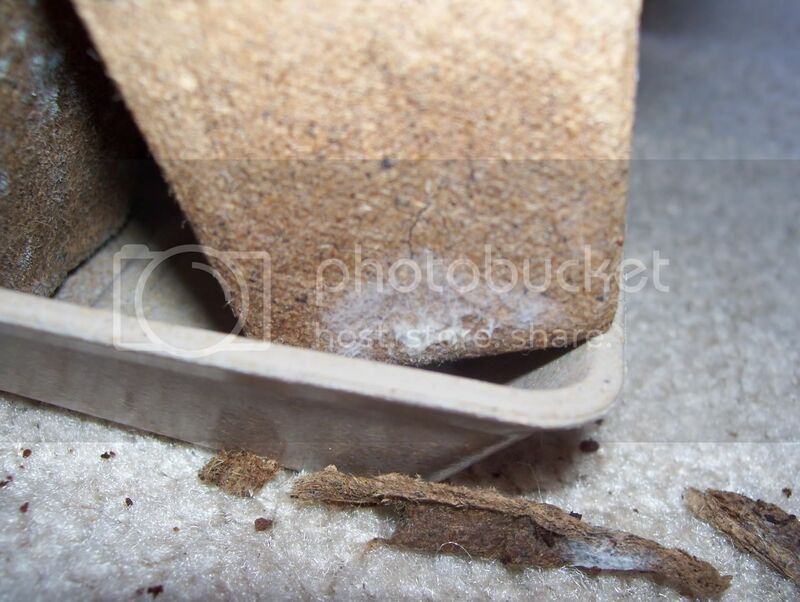 If you separate your peat containers, giving a little room around each, and let them dry a little more between waterings, the mold problem may go away. Perhaps try dabbing a dilute chlorox solution directly on the mold areas. 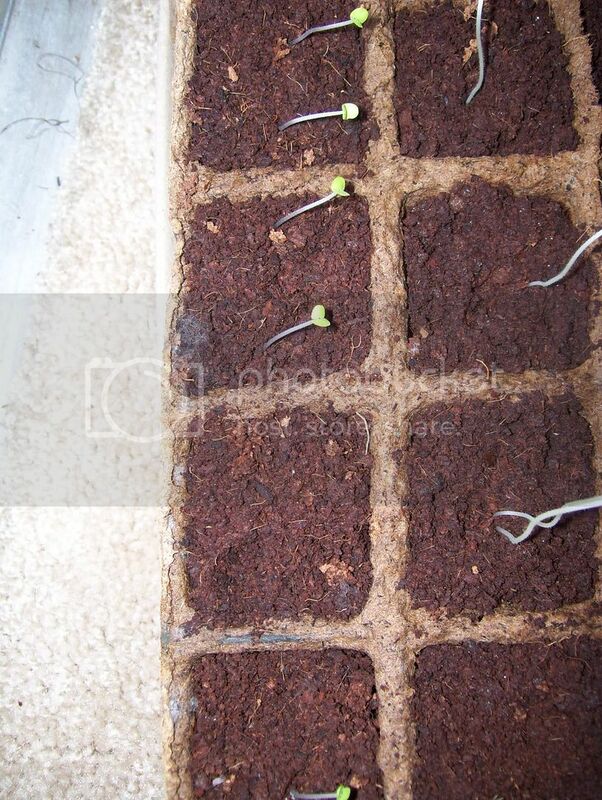 Seedlings should look kind of thick and stocky if they are getting adequate light. IMO the things necessary for healthy seedlings are bottom heat or general temp between 70 and 80 degrees for warm weather plants, adequate light, proper watering, and some gentle air movement. 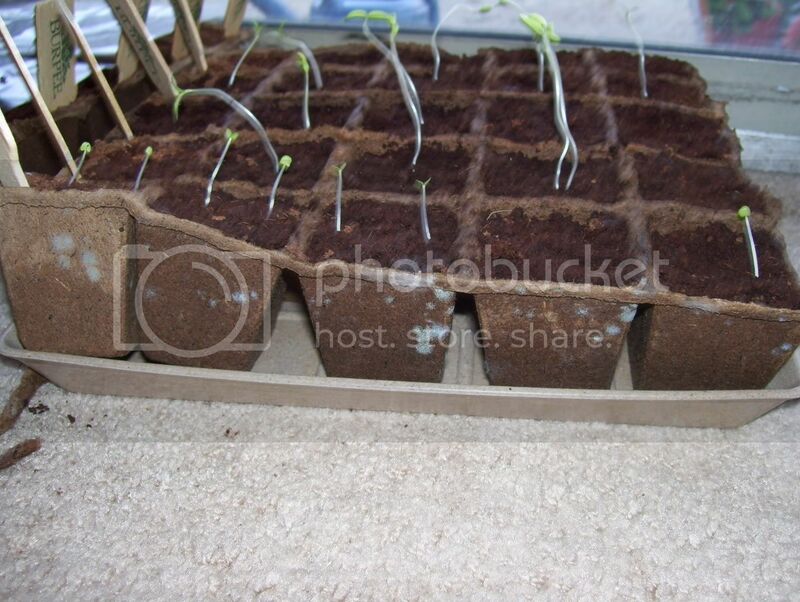 Finally, the seedlings should be exposed to direct sunlight whenever the weather permits. These tomatoe seedlings have been up 10-14 days and were just re-potted yesterday. good advice from hendi_alex re the fluorescent lights and air circulation. I have been starting seeds under lights for years now and I quit using peat pots early on. I use plastic as shown, for just the reason you have discovered. Peat holds the moisture in and stays too wet all the time. You want to water from the bottom. I use 3 in square pots so 18 fit nicely in a standard tray. They are going to sit in the trays, with water added in the tray every morning for some months (here in Ohio, only the hardiest stuff can go out before midApril and warm weather stuff more like end of april). The peat just molds & rots by then. You can get the plastic pots cheap from nursery supply places. The plastic isn't so bad re eco-friendliness, because I save them and re-use them year after year, making them also very economical in the long run. I agree with the previous posts. Do get growing lights - one year I finally gave up after having too many leggy, unsubstantial plants from lack of enough light. You can turn them all you want, but window-raised seedlings rarely seem to thrive. I agree the problem with the mold is likely too much moisture and not enough air flow. See my post under organic gardening for pictures and description of my seed starting operation! what should my summer savory seedlings look like?